Dreaming of relaxing on Waikiki beach? Just the mention of the Hawaii Islands brings thoughts of a tropical beach vacation with grass skirts, the deep-blue Pacific Ocean and colorful cocktails with tiny umbrellas. There is an abundance of vacation rental homes and lodging options in Honolulu on Oahu, including condos, houses, hotels and VRBO properties. In Honolulu, Hawaii's largest and popular city, you’ll find a variety of activities such as art museums, bike paths, and some of the most beautiful scenery in the world. Popular Waikiki Beach has soft sands and a relatively gentle surf. For majestic Oahu views, make to moderate climb to the top of Diamond Head – a 350-acre volcanic crater. Historic structures like Iolani Palace and Ali'iolani Hale are worth a visit on a non-beach day. As one of the most popular tourist destinations in the world, Honolulu on the Island of Oahu in Hawaii is a bucket-list item for most people interested in traveling to tropical destinations. 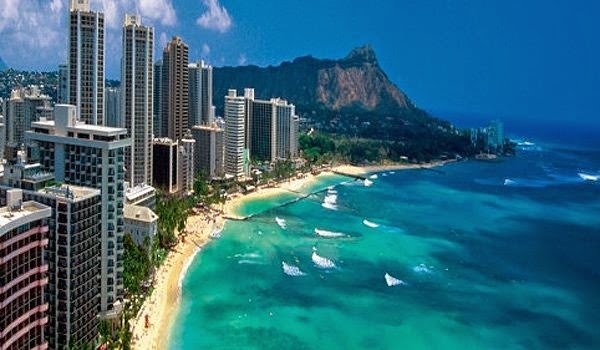 Honolulu Hawaii Beach Vacation Rentals, Hotel Deals, etc.